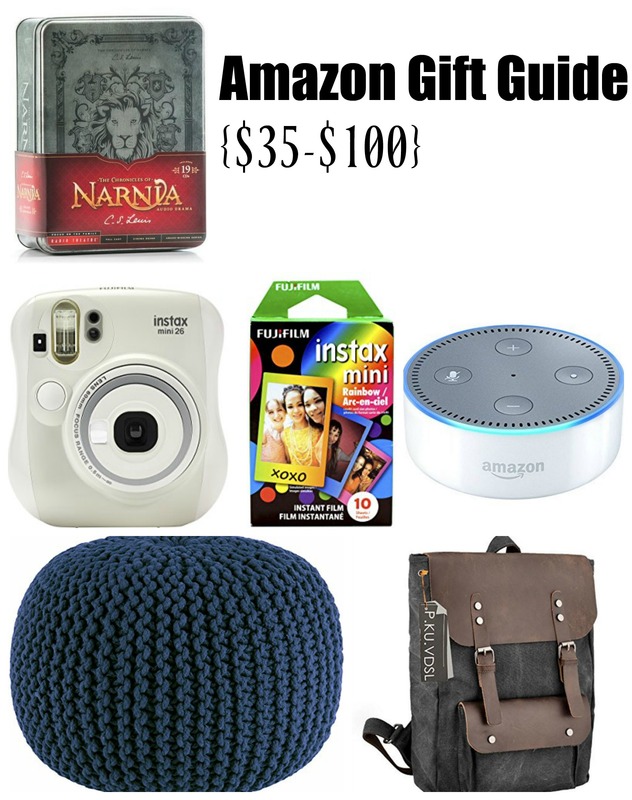 I’m back for my last installment of this year’s Amazon gift guide. This time, I’ve rounded up a group of items that–hopefully–will at least jog your thoughts for those bigger gifts that you still have to buy. Some are practical. Some are pretty. Some are both. I can’t think of a better gift that you could give anyone than God’s Word. And a great option for long drives or listening at night before bed or…really any other time you can listen but can’t read…is this set of audio cds. I realize that technology has advanced far beyond the common cd, and yet, I still find it most convenient to have a hard copy I can pop into a player (especially in the car). This would be a great gift for someone “old school” like me. Along the same lines, I mentioned that we were doing the “something you wear/read/want/need” for our kids again this year, and, for the boys, who have oooooodles of hard copy books to read, I’ve opted for audiobooks that we can listen to on our daily trek to and from the gym in the car. We already have the stellar BBC version of entire Chronicles of Narnia series, but I’m really tempted to get this one too, since it’s done slightly differently (the “narrator” is taken out and put down as the actual thoughts of the characters–a liberty which the reviews say actually works well) and includes a different voice for each character (the BBC version is read by one person per book). I haven’t pulled the trigger on Narnia yet, but I did get this audiobook on Dietrich Bonhoeffer , and I’m considering these Father Gilbert Mysteries (although, the fact that the reviews–which are excellent!–warn that some of the material is too serious for younger listeners has me thinking I should wait). This is another one of those where, if wholesome audiobooks intrigue you but you don’t love the sound of any of these, all you have to do is scroll to the bottom of the listings, and they have several more suggestions by the same company (all are produced by Focus on the Family Radio Theatre. All are supposed to be superbly done). I haven’t included hardly any gifts for men on these lists, but this leather + canvas backpack, which holds a 15″ laptop, would make a great guy gift. Or girl gift. I’d certainly carry it too! I love essential oils! I’m not really that “oily,” as they say–meaning that I don’t consistently start my day by rubbing specific blends on my body–but I am a believer in their medicinal qualities. I have been known to oil myself or my kids up for everything from colds to rashes to fevers and more. Sadly, my diffuser broke months ago, and I didn’t replace it until recently, but this option is considerably more stylish than the one that I found and would make a great gift for an oil-lover in your life. I just bought one of these Instax Mini 8 cameras as a gift for the whole family. Not only do I think my kids will have an absolute blast taking pictures of–well, let’s be honest–walls and empty toilet paper rolls, but I have a VERY practical/self-serving use in mind. It’s probably 89% of the reason I bought it. We sponsor several children through various organizations, and I DREAD writing them letters for one simple reason: printing pictures. The letter-writing part is easy! But having to go to a store and print pictures gives me mild hives (yes, I know it’s ridiculous, but it’s also true). And yet, I know that they love receiving those pictures, so I’m over-the-moon excited about the prospect of instantmini snaps we can include in our sponsor letters! Woot! One thing I hope to do in the new house is have a rolling garment rack in the master closet on which I can set out clothes for the week. I’m hoping it will help me get dressed in “real” clothes every day and utilize my entire wardrobe (or, at least, highlight the items that never get worn, so I can weed them out). We’ll probably make our own DIY pipe version, but if you or someone you know is on the hunt for something similar that’s cute and reasonably priced, then this one should definitely be in the running. It comes in bronze (shown; the other options are cheaper), black, and white. If you’ve got a lover of nostalgia in your life, I can’t think of a much cuter gift than these Crosley record players. They come in a variety of punchy colors and have generally good reviews (although, they’re not known for amazing speaker quality). I love these cable knit poufs. I’ve been on the hunt for one for the nursery in the new house for a while, and I think this one just may be what I choose. It comes in TONS of color options, has good reviews (for the most part), and is the best price I’ve found outside of a major sale (Prime shipping too!). Another fun home trend is these sheepskin rugs. I already got one for the nursery, but it would also work great as a thrown across a chair or in any small space that needs a bit of cozy texture. Have a basic sewer in your life? I can personally attest to the fact that this is a great, lightweight, cute (!) starter machine. It has fabulous reviews and is really reasonably priced for all of the features that you get. I got the same machine for about $40 less for Della on a Black Friday sale, but it was also refurbished (haven’t had any issues). So far, we’ve only experimented with the most basic of functions, but it’s a great little machine! I know, I know. A toothbrush? Really, Abbie? But seriously. I got one of these as a gift for Shaun a couple of Christmasses ago, and he LOVES it! If you read my review of our Amazon Echo, then you already know that I’m a fan. And that hasn’t changed. We use our “Alexa” on a daily basis for entertainment (mostly music + a few games), education, and practical things (like shopping lists, setting timers, and ordering cat food and toothpaste from Amazon). Well, the Echo Dot lets you do all of those same things…but at a much lower price point. As far as I understand, the main difference is in the speaker quality (the full-sized Alexa’s speaker is rather impressive). If that doesn’t bother you, then this miniature version would make a great gift for the multi-tasking techie in your life (or even, as I noted in the review, the non-techie–AKA: me). Hopefully, all three of these guides (or, again, any of the ones in the past, which still have plenty of options that are still available) have been helpful for you. We’ll be back to our regular, non gift-guide program next week, but–in the meantime–happy shopping! I loved the Focus on the Family version of Narnia growing up, and had been looking for it but thought it was no longer being sold! This is going on my list of things to pick up on our next USA trip (we live overseas). I seriously love your Christmas lists!! I’ve purchased multiple gifts via them in the past. So helpful!! You know? I will check them out, but I kind of despise the ENTIRE process…including uploading pictures to websites (it seems like something always goes wrong or doesn’t load properly). But I will try them!